For the notorious kids of yours, what is impeccable is teaching them the basics of a sport especially the FOOTBALL. Make sure that your kid learns to catch and throw as soon as it is able to escape the scolding or the beating of yours. 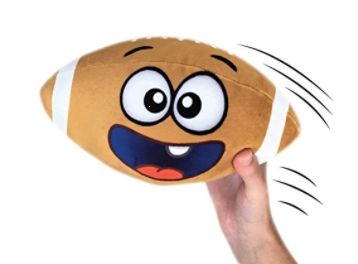 The hilarious football where the ball screams when your kid drops the catch and smiles when it catches is something that is for sure going to make your child burst into laughter. Thanks to the senses!!! It is not going to let you to rest in peace. This hilariously interactive sport is meant exclusively for the kids above 3 years. From “soft catches” to “highest toss”, the ball laughs and smiles harmonizing with that of the child. Sporty songs are enough to make sure that your child rolls over with the ball each time it is tossed at it. Does your kid think of the football? Duh, no!!! Compel it to go out tossing and dancing, tackling, touching downs for a big play. Don’t let your kid keep calm when the ball rolls out. Get the best of the kid that most of the coaches tell the players not to be. Tell your kid in times of their grumpy mood that the ball too is in grumpy mood. Grrrr…. a very grumpy mood indeed!!! Let the love of football in the child grow with age but not get old as soon as the child gets grey hairs. This loud-mouthed football is going to spill all the beans that happen to it. Things get worse, sometime terrible when crying sound is heard from the football if left unattended for a longer period. Awwww.. So cute!! It’s time to bring the grieving football back into the family and toss it up again to make it burst into laughter.